The good news is that the daughter of renowned 60s R’n’B singer Robert Higginbotham has just released her 6th album. What? You’ve never heard of him or her? Well, Regina B Higginbotham is better known as Teeny Tucker, and her father was the redoubtable Tommy Tucker of Hi-Heel Sneakers fame. But then she hasn’t and certainly doesn’t need to ride on any coat-tails, Teeny is a blues singer of power and soul, and can put more emotion into a single note than some do in a lifetime. I won’t detail her history here as the wonderful Lori Graboyes (“One To One Blues Woman”) is interviewing her elsewhere on Bluesdoodles and does a much better job than I can here. This latest album, Put On Your Red Dress Baby; those words may sound familiar as they are taken from Tommy’s aforementioned hit. Her cover of that classic, in this new guise, is also the centrepiece of this album. It opens with Church House Prayer and introduces us to the excellent guitar playing of Robert Hughes as he cleverly builds to the riff. Teeny then begins to display why she deserves more recognition as she delivers a vocal of depth and a clear diction bereft of the histrionics beloved by some. A short harp and guitar solo add colour to a blues shuffle of quality. Love Don’t Hurt is a slightly faster shuffle with more masterful guitar and a strong vocal performance as Teeny incorporates references to the modern curse (social media) into the lyrics. Learn How To Love Me has a slow blues intro with such passion, helped by the gospel feel from the backing vocals. It develops into a faster R’nB style with more tasteful guitar and the B3 warming it all up and backed by a simply superb bass line. Up next is I Sing The Blues (probably best known from the Etta James version but also known as I’ll Sing The Blues For You which has been covered by many…my favourite is the Moody/Marsden version off Ozone Friendly). Here, it transforms into a grittier version with the riff taking due prominence and Teeny doing a fine job with power and grit to match the guitar. Heart, Mind And Soul is everything that is good with modern blues…a slow heart-wrenching vocal backed with intuitive guitar and bass with an untypical drum pattern completing the set. The guitar on this is stunning in its effortless reflection of the vocal and the emotion therein. Blind Lemon Jefferson gets the Tucker/Hughes treatment on One Kind Favour. Already a fabulous, atmospheric song (also recorded by many, sometimes as See That My Grave Is Kept Clean…in fact Glenn Hughes delivers his finest performance ever on a cover of this song from Stuart Smith’s solo album, Heaven and Earth), Teeny takes it to a different dimension with a positive sounding timbre and light guitar work from Hughes of the Robert variety…love it! Next up is the interpretation of her Dad’s big hit. 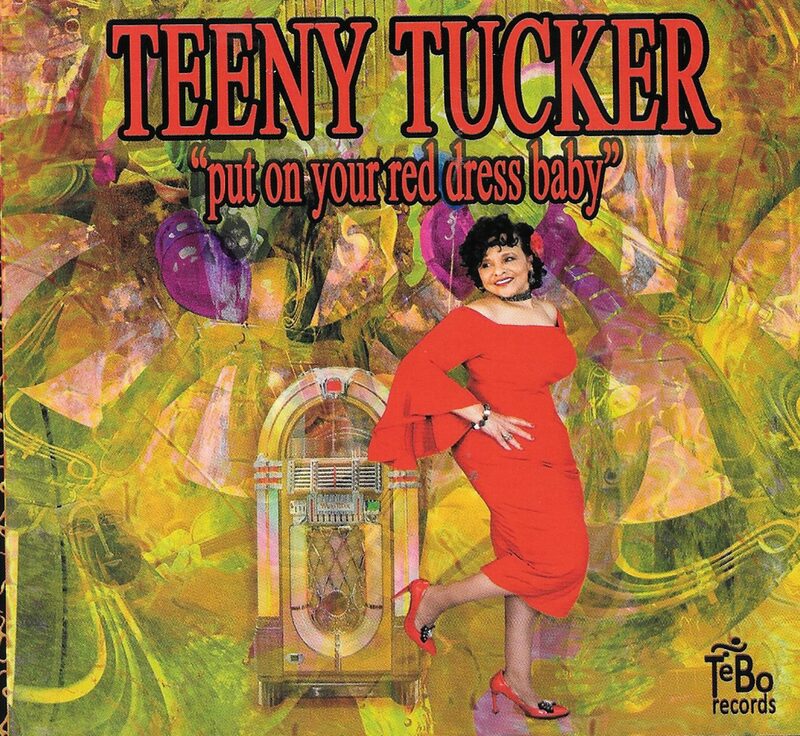 Put On Your Red Dress Baby takes Hi-Heel Sneakers and updates it without taking an iota of the R’n’B energy and fun from it and Teeny cleverly adds to the lyrics to acknowledge the original’s inclusion into the Hall of Fame. The guitar helps with the empathetic tones and picking but is gloriously extended into a lovely solo. Don’t Look Back (in the Rear View Mirror) has a rolling backing reminiscent of Baby Please Don’t Go, but the piano and guitar are so different and, after Teeny says “go Bobby” he most certainly does and again adds so much to the passion of the song. Crack The Door slows the pace with a soulful blues of guitar over B3 and the vocal powerful as ever. Best of the bunch for me is the guitar driven track, From The Skies, where Hughes seems to reference and pay tribute to BB King and Hendrix, particularly toward the end. The vocal is nicely restrained and full of feeling as the B3, bass and drums show suitable restraint. Jump Back is indeed a jumping blues number bringing the Stones to mind in its structure. It’s a fun three minutes but the weakest of the album. It all closes with two versions of the Etta James classic I’d Rather Go Blind. The short version is just an edited version of the long version that, at just over eight minutes might put off some radio stations. Anyone brave enough to take on such a seminal piece is valiant indeed and, in this case, hugely successful in at least equalling Etta’s original performance. It actually tips the scales for me due to the imaginative guitar backing and soloing. This album shows a vocalist who can display complete control of a voice that can go effortlessly from a whisper to an anguishing cry. She has ensured a band of quality is there to match the vocal input and together they have produced an excellent soulful blues album that will be getting repeated listens from me. Songs composed by Teeny Tucker/Robert Hughes except where indicated.